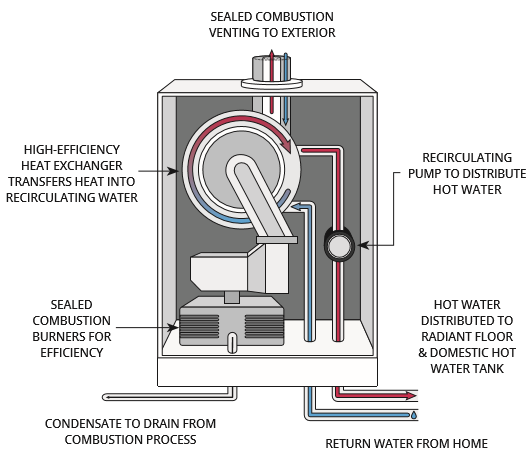 What are ENERGY STAR gas boilers? Many homes have improperly sized and poorly installed heating equipment. This can cause uncomfortable rooms and increased energy costs, while shortening the life of the equipment. An ENERGY STAR® certified boiler is a common solution chosen by many homeowners in areas with gas service to bring the benefits of luxurious radiant warmth and cost savings to their home. A boiler heats your home by burning natural gas to heat water that circulates to wall mounted radiators or radiant floor systems. This type of heating technology distributes radiant heat for your home through a series of insulated pipes to individual rooms, rather than through a forced air duct and vent system. Radiant heat warms objects in the room and your body rather than just the air in the room, providing a comfort you can feel.